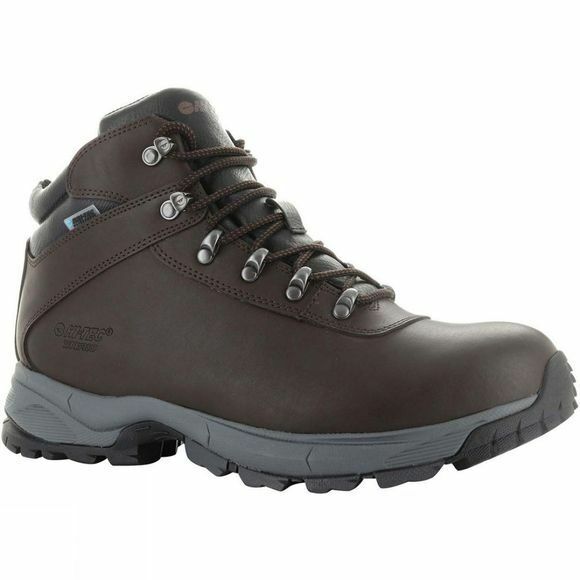 The Mens Eurotrek Lite Waterproof Boot from Hi-Tec are ideal for light hiking. They have a Dri-Tec waterproof and breathable membrane to keep feet dry in wet conditions or when walking through long wet grass. The durable rustproof hardware lacing system helps to create a snug and secure fit while the leather upper adds further durability and a classic outdoor boot look. The removable moulded insole and compression moulded midsole with shank provides underfoot cushioning comfort. A durable Multi-Directional Traction (MDT) rubber outsole provides grip on varied terrain. A great choice for men who enjoy the outdoors come rain or shine.